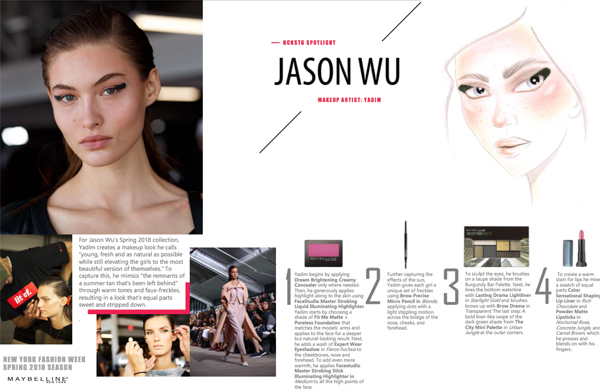 Yesterday, Maybelline New York created the backstage makeup look for the Jason Wu SS18 shows. For Jason Wu’s Spring 2018 collection, Yadim creates a makeup look he calls “young while still elevating the girls to the most beautiful version of themselves.” To capture this, he mimics “the reminisce of a summer tan that’s been left behind” through warm tones and faux-freckles, resulting in a look that’s equal parts sweet and stripped down. Yadim begins by applying Dream Brightening Creamy Concealer only where needed. Then, he generously applies highlight along to the skin using FaceStudio Master Strobing Liquid Illuminating Highlighter. Yadim stsrt by using a shade of Fit Me Matte + Poreless Foundation that matches the models’ arms and applies to the face for a deeper but natural-looking result. Next, he adds a wash of Expert Wear Eyeshadow in Fierce Fuchsia to the cheekbones, nose and forehead. To add even more warmth, he applies Facestudio Master Strobing Stick Illuminating Highlighter in Medium to all the high points of the face. Further capturing the Dream Brightening Creamy effects of the sun, Concealer only where needed. Yadim gives each girl a Then, he generously applies unique set of freckles highlight along to the skin using using Brow Precise FaceStudio Master Strobing Micro Pencil in Blonde, Liquid Illuminating Highlighter. applying dots with a light stippling motion across the bridge of the nose, cheeks, and forehead. To sculpt the eyes, he brushes on a taupe shade from the Burgundy Bar Palette. Next, he lines the bottom waterline with Lasting Drama Lightliner in Starlight Gold and brushes brows up with Brow Drama in Transparent. The last step: A bold liner-like swipe of the dark green shade from The City Mini Palette in Urban Jungle at the outer corners. To create a warm stain for lips he mixes a swatch of equal parts Color Sensational Shaping Lip Liner in Rich Chocolate and Powder Matte Lipsticks in Nocturnal Rose, Concrete Jungle, and Carnal Brown, which he presses and blends on with his fingers. ￼￼Yadim starts by choosing a shade of Fit Me Matte + Poreless Foundation that matches the models’ arms and applies to the face for a deeper but natural-looking result. Next, he adds a wash of Expert Wear Eyeshadow in Fierce Fuchsia to the cheekbones, nose and forehead. To add even more warmth, he applies Facestudio Master Strobing Stick Illuminating Highlighter in Medium to all the high points of the face. You should follow me on Twitter! © Copyright Makeup and Beauty blog | TalkingMakeup.com 2006-2011. All rights reserved.